RandA lathes were manufactured by the London firm of Ross and Alexander of 165-7 Bishopsgate, London E.C.2 - hence the make-up of the name "R-and-A" - and were also branded for sale through large UK retailers and mail-order companies such as Tyzack and Gamages. There was also an interesting "cross-fertilisation" amongst many UK-based manufacturers of small lathes with examples of Zyto lathes being badged as RandA and some RandA models as both Winfield and Grayson - obviously to fill a gap in their respective makers' rather narrow model ranges. Interestingly the Winfield-badged RandA was fitted with tumble reverse drive to the leadscrew, a useful feature missing (so far as is known) from all other versions. RandA lathes have also been found badged as "Pools Specials" for the well-known Nottingham Tool Company (who also re-badged other makes) and as the "Pexto" by the Peck, Stow and Wilcox Company of Southington, Connecticut, USA. Although RandA badged lathes for other makers, their Model B was, until 1935, built in Sheffield by Charles Portass and Company. 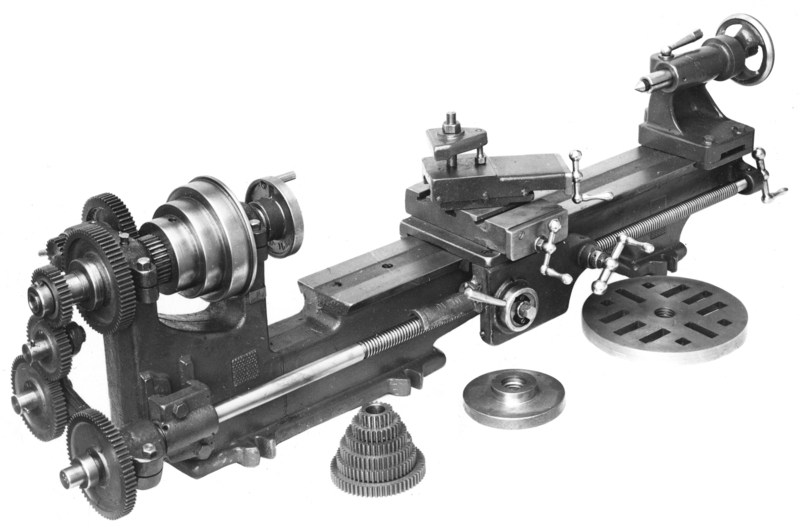 Various models were offered over the years including the Type A, Type B and the "New RandA" - this latter a 3" x 12.5" lathe of simple design with a single swivelling tool slide, gap bed and an optional backgear assembly. A set of changewheels was provided for screwcutting and the drive could be engaged and disengaged through a simple dog clutch on the leadscrew. Although all RandA lathes were of pre-WW2 design, and constructed in a very simple, almost crude way, they continued to be advertised and sold until the mid 1950s. The final two lathes to bear the RandA badge were both badge-engineering exercises; the Zyto, from S. Tyzack & Sons (famous before the Second World War as a large retail mail-order company) could have had only a short life span (with production finishing in 1959) whilst the very last machine, advertised in the Model Engineer magazine on April 21st, 1972, was the Jason, a lathe that never achieved the status of mass production. When bought the Randa Type A long-bed was rusty all over - although oil had helped in some places to keep areas of paintwork un-touched and original. The headstock backgears, for example, have been refinished in a shade of red that matches that when factory fresh. 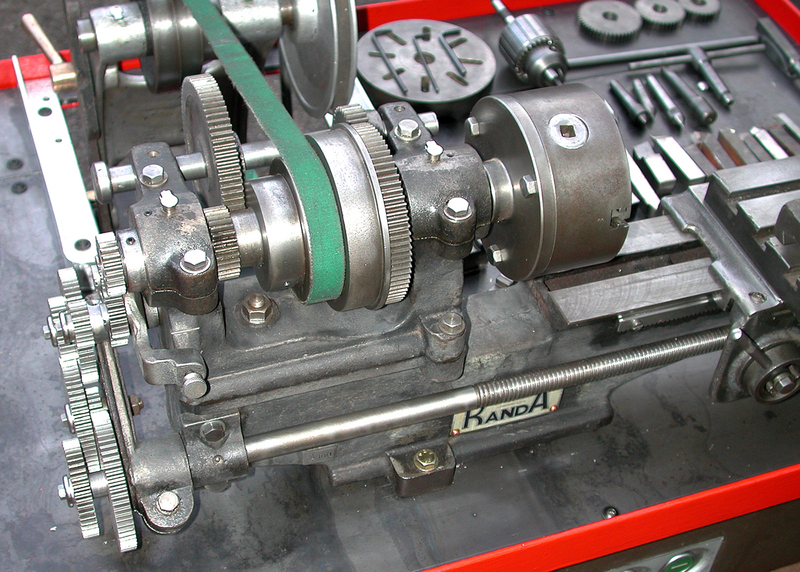 When stripped to its component parts, the lathe was found to be in remarkably good mechanical condition with little wear evident on bed or slides. Even the leadscrew, its clasp nut and the cross and top screws were in remarkably good order. The main iron castings all proved to be sound - and of better quality, the owners reports, than one of his more recent Far Eastern lathes. A few simple replacements were undertaken: the slotted gib-strip adjustment screws replaced with 3/16" BSF Allen grub screws; headstock bearing drip-feed oilers were fitted - the holes found to be already tapped out BSP - and a clamp handle made to speed adjustment of the changewheel bracket. Fitted with a 1/3 h.p. motor and a home-made countershaft (incorporating a cleverly-made belt-tension adjustment jockey wheel) the lathe has been put to good use and proves to have excellent torque, better even than the owner's Warco WM180 which almost stalls when trying to turn a 7-inch diameter flywheel - the Randa has no such trouble, and powers through the same job..
Badged as a RandA--but almost certainly a version of the ubiquitous Portass Model S as made in Sheffield by Charles Portass & Co. 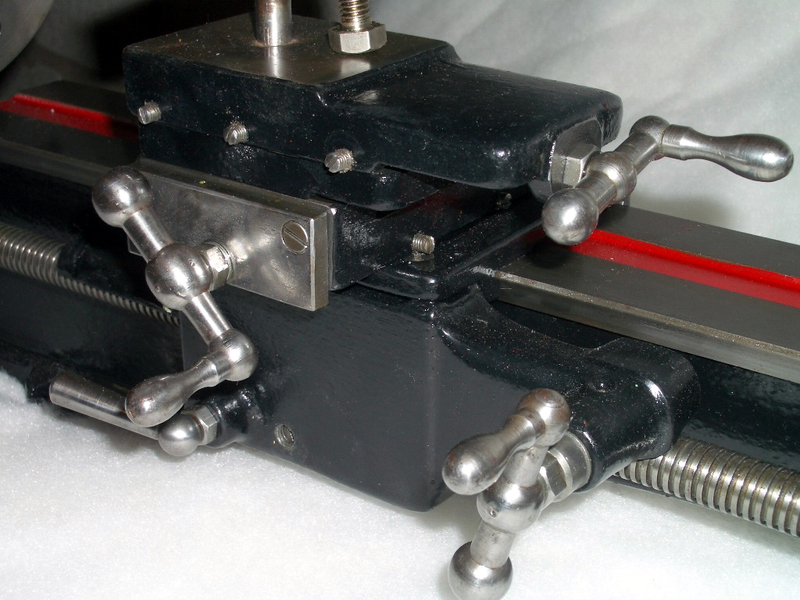 The Randa Type A and B backgeared, screwcutting lathes were both the same size but, whilst the A had a full compound slide rest, a T-slotted cross slide and a foot at the tailstock-end of the bed, the B was fitted with a simple non-swivelling top slide and a cantilever-form bed. The "B" badge shown cast into the bed in the picture above (and the "A" badge in that shown below) appear not to have been used on production lathes. The slide-feed screws had proper, square threads, but they ran direct in the castings, without benefit of replaceable bushes. A quick-traverse was fitted to the carriage drive, but not by the usual method of a rack and pinion drive. Instead, a steel worm wheel engaged against the top of the leadscrew and, just like the Myford ML10 which still uses the same system, included a direct-reading dial-thread indicator engraved on an inner ring next to the operating handle. 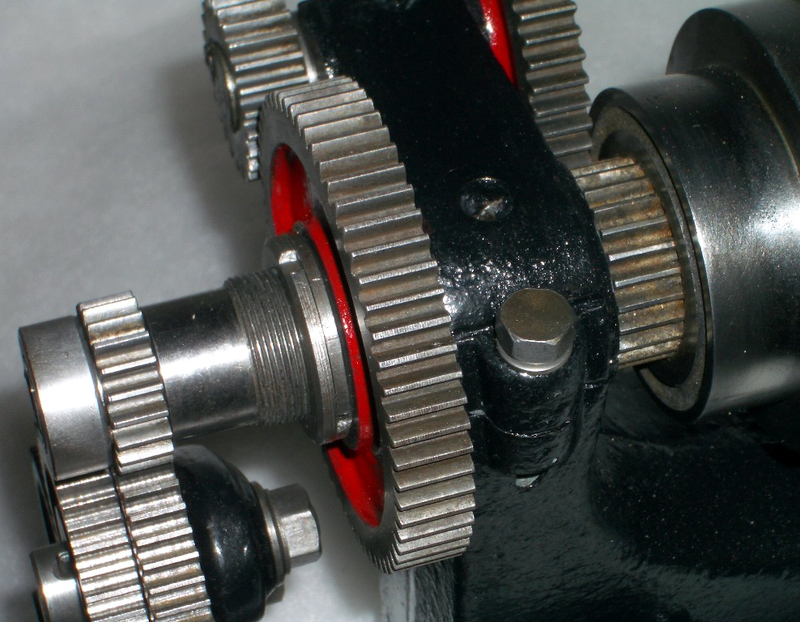 Because the gearing of the carriage traverse was very high (turn the handle a little and the carriage moved a lot) the leadscrew was fitted with a balanced handle at its tailstock end so the operator could maintain a fine feed by hand. A simple, one-sided unit (without even a thrust plate to support it) the carriage to leadscrews "clasp" nut was fitted with a spring-loaded "snap-action" engagement lever. As an option (though it can rarely have been specified) a special apron was available fitted with a double clasp nut, running in adjustable V guides and operated by a lever turning the usual type of an eccentrically-slotted ring. Bored through 3/8" clear, and one-inch in diameter, the spindle carried nose of 1" x 12 t.p.i and the same No. 1 Morse taper as the tailstock. The three-step headstock flat-belt cone pulley had diameters of 3.75", 3", 2.25" and was 0.75 inches wide. The capacity in the gap was eight inches and the backgear, which was arranged in the simplest way possible with the bull wheel fitted to the left hand end of the spindle, had a ratio of 6 : 1. Each lathe was available with a capacity of twelve or twenty inches between centres and came complete with a set of ten changewheels for screwcutting, a 6.5" diameter faceplate, a 3.25" catchplate and a machined chuck backplate. Of very limited extent, the maker's accessories list contained just a 3-jaw chuck, a treadle (often described as a "foot motor" in contemporary literature) a countershaft for motorised drive and a complete stand with tray and countershaft drive installed. The latter, at £4 : 7 : 6, cost only two shillings and sixpence (251/2p) less than the lathe - whilst even the 3-jaw chuck represented an additional investment of some 38% of the basic price..
Long-bed RandA Type A 3" x 20" gap bed, backgeared and screwcutting with a proper compound slide rest and T-slotted cross slide. Badged as a RandA but actually a Zyto, this late-model machine has survived in remarkable fine and original condition. Readers who have tried it will know that setting up a fine-feed compound gear train on the L-shaped changewheel bracket is not the easiest of tasks. 4) modus operandi: the drive belt turns pulley and the little gear fastened to it; the little gear drive larger of the outboard cluster gears; the shaft carrying the larger cluster gear has a smaller gear on its other end that drives the large gear fastened to the outboard end of the spindle.